As this week started I found myself with dinner plans on 3 of 5 weeknights and way too much of last week’s CSA produce that still needed to be used. The problem was that my assortment was a bit random: a million garlic scapes, purple kohlrabi, a giant head of broccoli, and collard greens. I knew I needed to use the lot of it in one epic dish. 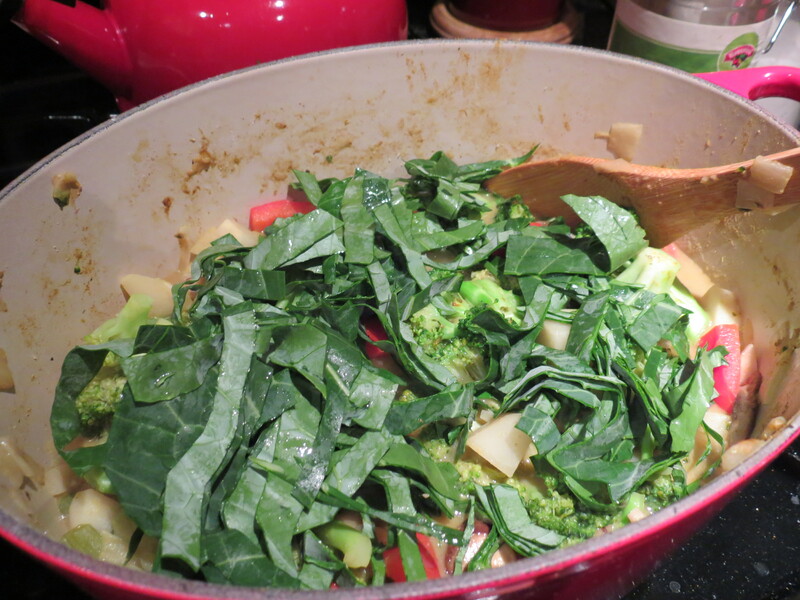 After some research and a bit of searching on pinterest, I decided that when life gives you an abundance of veggies… make a curry! And OH.MY.GOD. was I glad I did. 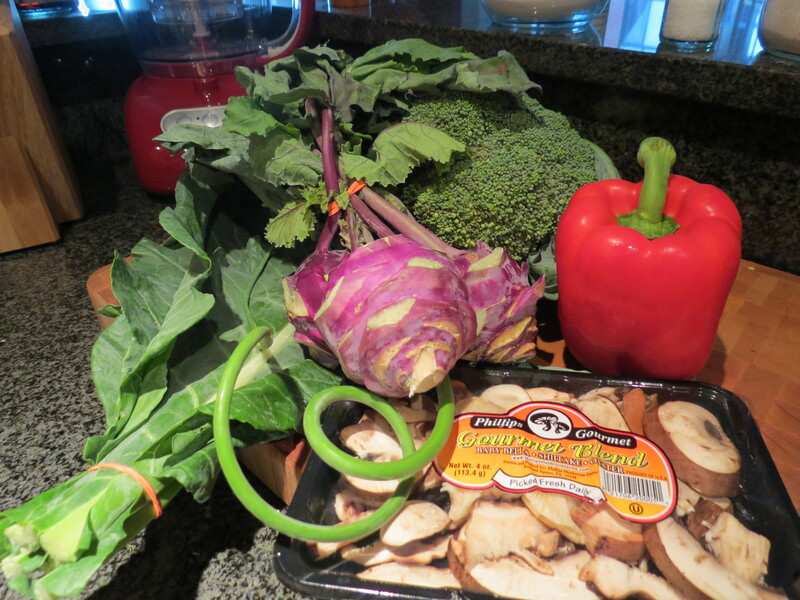 So let’s talk about this assortment of veggies shall we? As you know from last week’s post, garlic scapes are an easy garlic substitute that add great flavor and are an easy add in to many kinds of dishes from eggs to roasted veggies to curries. Purple kohlrabi threw me for a bit of a loop. I had heard the term kohlrabi but couldn’t have told you anything about it. If you search for images of it, it sort of looks like what I imagine the heart or another central organ to look like in that it has a bunch of stalks (read:arteries) coming off of it that all lead to this large center bulb. Mine were trimmed and reminded me of a dragon egg or something other-worldly. When you peel away the outer skin, though, the inside looks much less terrifying and it tastes like a potato and a radish had a baby. Broccoli is broccoli, but I love it because it’s generally a crowd-pleaser, takes on flavors really nicely, and would be a familiar face in the pot with the dragon egg. And collard greens are nice and neutral, a bit thicker of a green than spinach and have a subtle flavor on their own or as part of a larger symphony. So let’s get to this curry shall we? Aside from the cous-cous I served with it, curry is a one pot meal, which always makes me happy. It also makes my husband (who is in charge of doing dishes after a meal) pretty happy. I used my coated, cast iron dutch oven, but any deep and wide vessel will do. I built flavors a bit out of order, but the good news is it was still delicious and curry it a forgiving recipe that can be built upon pretty easily. I will walk you through my steps and then add some final thoughts at the end of what I would do differently. Start with coconut oil in the pot over medium heat. 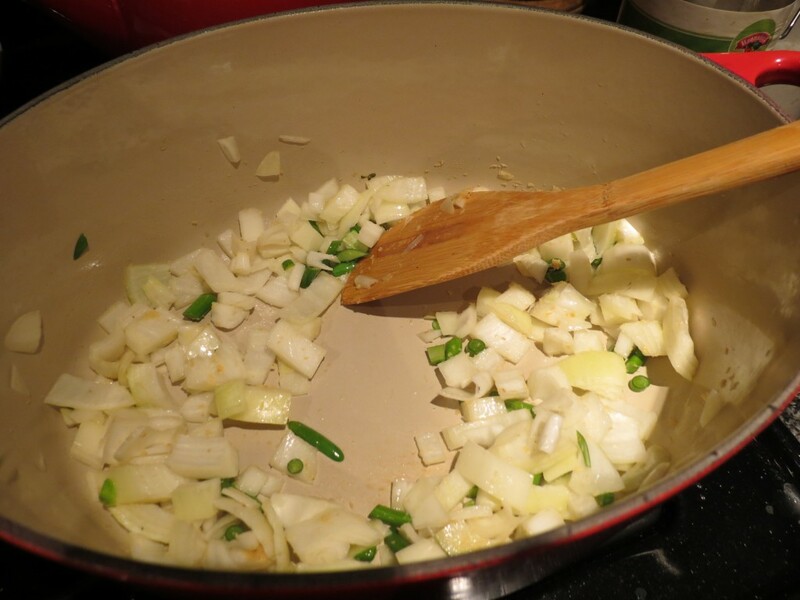 I love using coconut oil when I am making ethnic dishes because it adds a subtle coconut flavor and compliments the spices and of course the coconut milk well. Next add ginger root (grated/minced), onion, and garlic scapes and cook 2-3 minuted until onions become translucent. 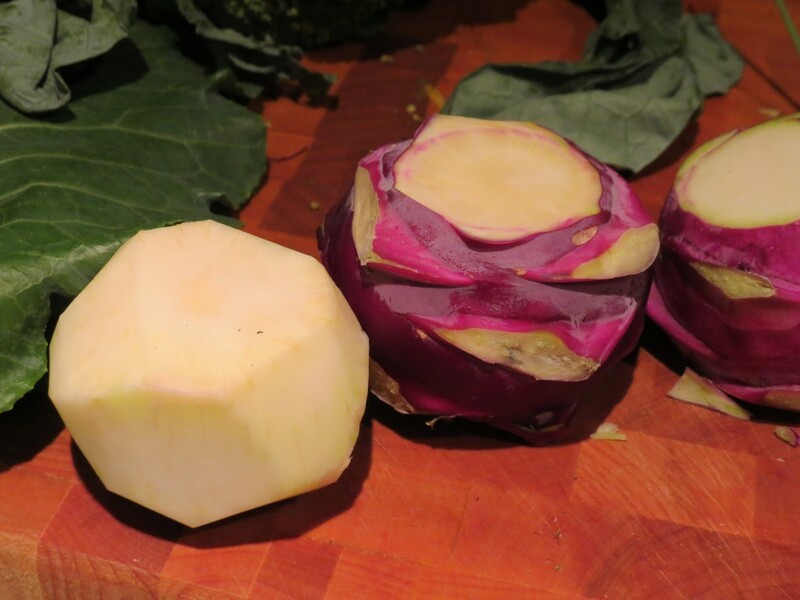 All the blogs were talking about how important it is to peel the kohlrabi well because the outer skin is very thick and tough. I found this was easiest to do with a sharp knife rather than a vegetable peeler because of all the rough edges from where the stalks used to be. Once you remove the skin, cube and add to pot with chicken broth (or vegetable broth if you want this to be fully vegetarian) and cumin. 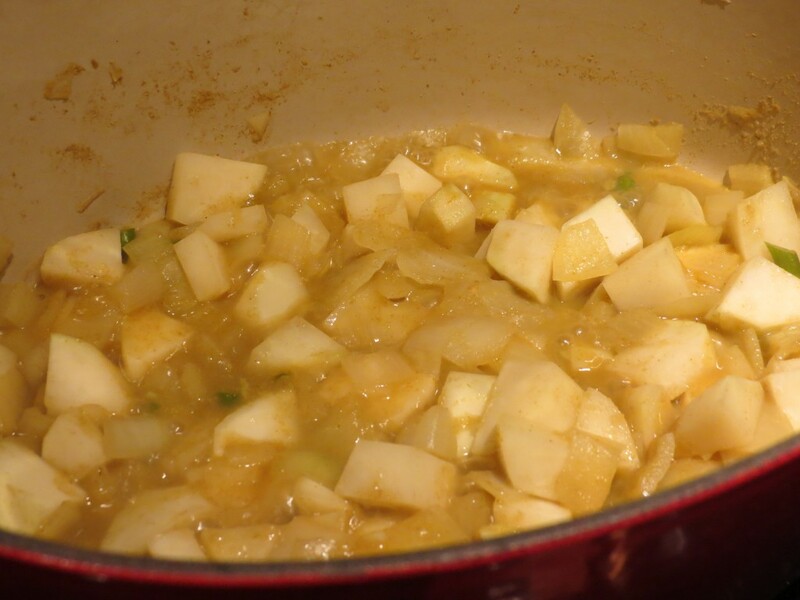 Cover and cook 5-7 minutes until kohlrabi becomes tender. There’s still more cooking ahead for it, so it’s OK if it’s not fully tender. Next add what will feel like an obscene amount of vegetables (broccoli, bell pepper, mushrooms), green curry paste, curry powder, and coconut milk. Start with 2 Tbsp of curry paste and add more as your taste prefers. I found that 4 Tbsp was the right amount for this dish. 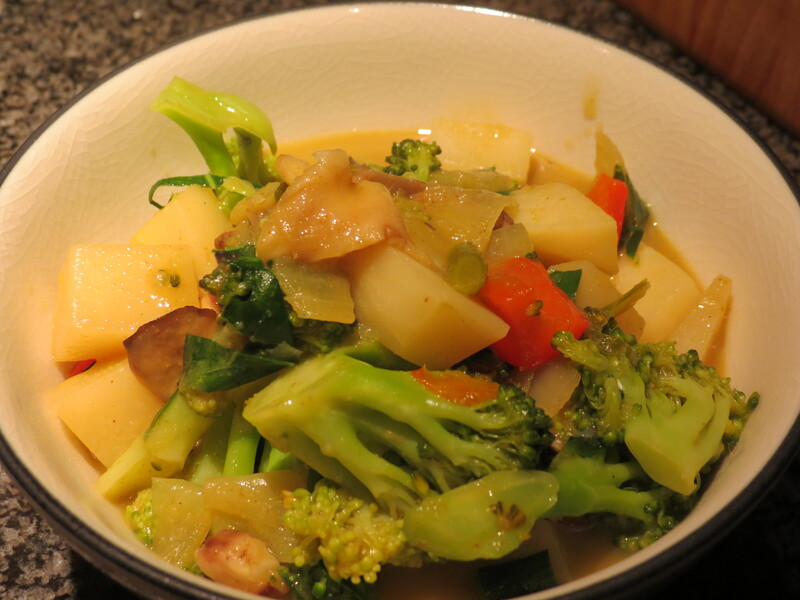 It might be a bit challenging to mix the curry paste in with all the vegetables, but stir as much as you can and as the veggies cook, they will shrink down and as the broth comes up a boil it will help the mixing process. Salt helps flavors become more pronounced, so as your dish begins to come together, add salt and taste the broth until you’re happy. 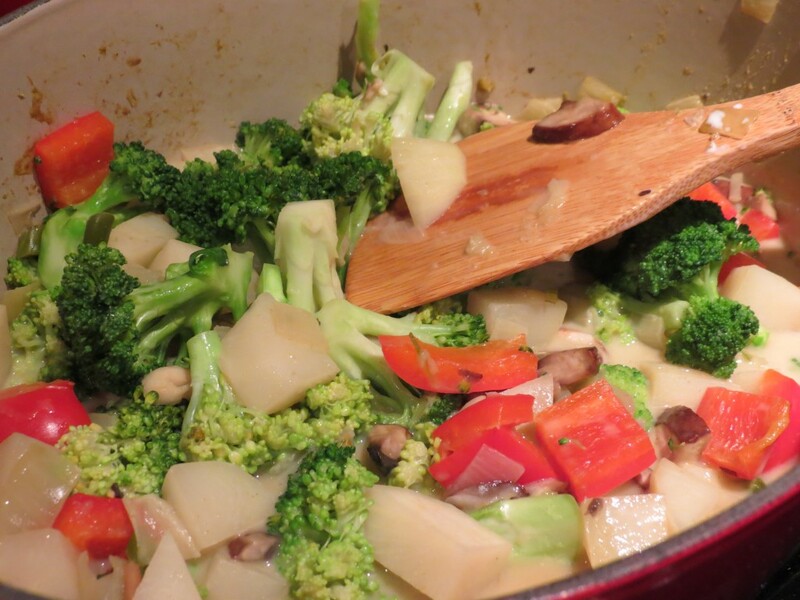 Once the liquid comes to a boil, cover and simmer for 5 minutes or until broccoli has reached your preferred tenderness. Lastly, cut collard greens into ribbons and stir in to dish. Let simmer 1 minute before serving. To remove the collard stems, simply cut or rip the greens away. As I mentioned before, I served this over a larger pearled cous-cous. It was actually a basil flavor cous cous and it was INCREDIBLE. As always, I got teased for my inability to cook appropriate amounts of food for 2 people, but I do not have a problem with delicious leftovers. And curry is one of those dishes that tastes just as good, if not better the next day. How can I describe this flavor? Green curry paste has a lot of nice light citrus flavors like lemongrass, kafir lime, and green chilies. It was hearty and complex, yet not in a heavy way. 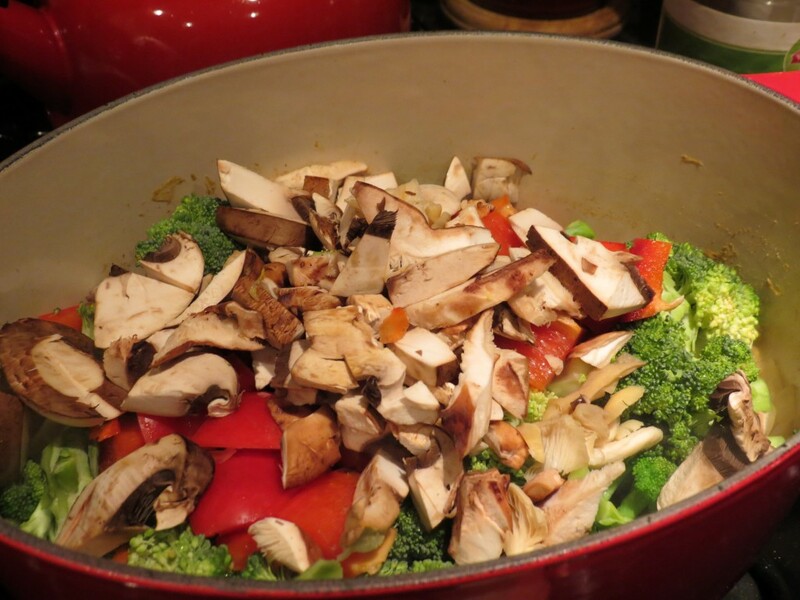 My husband complained for a few seconds about the lack of meat in the dish and you could certainly add meat (chicken would likely be best) but I had a mission to use produce and his complaint didn’t stop him from finishing his entire bowl…. and I wanted to lick mine clean I was so in love with it. This recipe made 4 large servings, each with less than 250 calories before cous-cous. 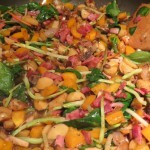 This dish feels so special, but as you can see is very easy. Go impress someone with it tonight! Final Thoughts: most curries start by blooming spices and building flavors. I would add the cumin, curry powder, and curry paste in the first step with the garlic scapes and onions so that they have more time to penetrate the veggies and can blend more easily.